It’s National cupcake week and mum asked if I could bake some Weight Watchers friendly cupcakes for her to take to her weekly meeting. 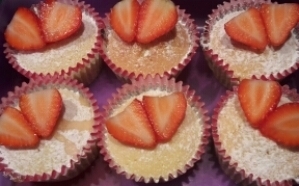 I used a Weight Watchers cupcake recipe found in the online community and made a few changes (removed the added salt, used a different way of decorating and flavouring). Preheat the oven to Gas Mark 4/180°C/fan oven 160°C. 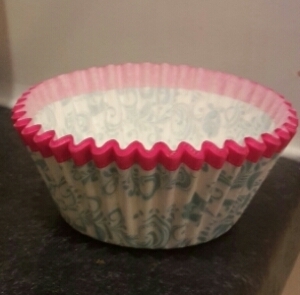 Place 12 paper or silicone standard sized cake cases into a bun tray. Mix the soft margarine, caster sugar, eggs, vanilla essence and flour into a large mixing bowl, I used a hand mixer but you can also use a wooden spoon. Mix until pale and off a dropping consistency. Spoon the mixture evenly into the cake cases. Bake in the centre of the oven for approximately 15 minutes, until risen and golden brown. Cool in the tin for a few minutes, then transfer to a wire rack to cool completely. 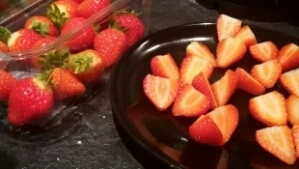 Meanwhile, prepare the strawberries. I cut the tops off then cut in half. 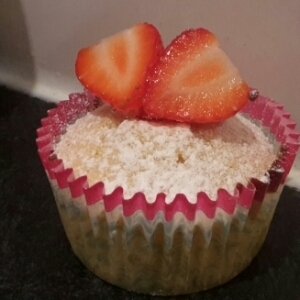 Sprinkle with confectioners (icing) sugar and add strawberries. P.S. I got the decoration idea from Mighty Delighty who used raspberries.